AirPrime SL Series offers smart connectivity for consumer and industrial applications. Its standard 25 x 30 mm LGA (Land Grid Array) package allows fully automated manufacturing for high-volume production. Available in multiple air interfaces versions (EDGE, HSDPA, HSPA+, CDMA 1xRTT and EV-DO), the AirPrime SL Series presents an easy upgrade path to next-generation network technologies. With its application framework and cloud-based device management services, the smart AirPrime SL Series accelerates your M2M deployment. AirPrime SL Series modules have a solid track record in several M2M sectors such as transportation, energy, industrial, security, sales & payment, networking, field service and healthcare. 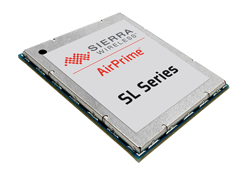 AirPrime SL808x offers HSDPA connectivity and quad-band GSM/GPRS/EDGE network access for global coverage. It supports the Open AT application framework. 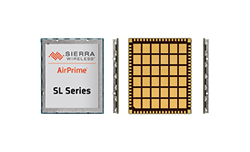 AirPrime SL301x and SL501x offer dual-band CDMA 1xRTT and EV-DO connectivity with GPS and antenna diversity.